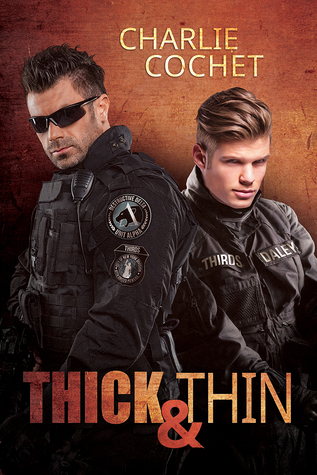 'Thick & Thin' is the 8th installment in Charlie Cochet's series THIRDS and for me it was more of a bridge linking what's happened to the changes that are about to happen and the new direction that things seem to be going in. It wrapped up some things from 'Smoke & Mirrors' the 7th book and it also gives us a peak at the changes that will be happening to Destructive Delta as a team and on an individual level. While I liked this and it was nice to get a bit more info to complete the events from 'Smoke & Mirrors' I was a little disappointed at the brevity of the story and it just didn't seem to have the edginess that I've come to expect from this series. However, I'm still looking forward to seeing what happens next. One of the things that I've really love about this series is that while each story may focus on one couple...Dex & Sloane, Ash & Cael, Calvin & Hobbs...we also get to see what's happening with the rest of the group as well. I love those little glimpses of the individual members and of their interactions with members of the team other than their partner and I have to admit I'm really, really hoping that with this new change we don't lose that. I love Dex & Sloane but I still want to see Dex & Ash tormenting each other, Dex protecting his little brother, Cael or Sloane & Ash having a beer as Ash complains about Dex or to loose the presence of Letty and Rosa the only consistent strong females in the series or the glimpses of this group as they relax on their downtime and party hard at Bar Dekatria. 'Thick & Thin' for me was a story that served as more of a bridge from what was to what will be...whether it's over troubled waters or not remains to be seen and for now I'm willing to make of show of faith and see what Ms. Cochet has in store for us on the other side of the bridge. An ARC of 'Thick & Thin' was graciously provided by the publisher in exchange for an honest review.